Now alone, Darren must continue his search to uncover what has been happening to him and lift the veil on his clouded past. What has he really seen? What do his torturous nightmares really mean? Who is the mysterious person that posted the bail to set him free? What demons lie waiting in the crypt? Return to face the dark forces that haunt the ominous Black Mirror Castle as you search for the secrets that lie behind the tangled web of haunting riddles, mysterious secrets and dark characters. Alternate between two playable characters, as you explore over 100 highly detailed and atmospheric locations; interacting with over 50 characters in your quest for redemption. Dare to find the answers in the climactic final chapter of this epic trilogy - for once you gaze into the Black Mirror, you won't be able to look away. In the final chapter in this acclaimed horror trilogy, Black Mirror 3: Final Fear picks up right where the thrilling ending to Black Mirror 2: Reigning Evil left off. Return to face the dark forces that haunt the ominous Black Mirror Castle as you search for the secrets the lie behind the tangled web of haunting riddles, mysterious secrets and dark characters. 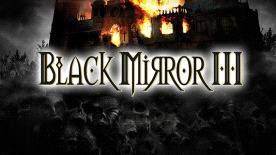 Alternate between two playable characters as you explore over 100 highly detailed and atmospheric locations, and interact with over 50 characters in your quest to find redemption..
Dare to find the answers in the climactic final chapter of this epic trilogy - for once you gaze into the Black Mirror, you won't be able to look away! © dtp Entertainment AG. All rights reserved. Published under license by Viva Media, Inc.